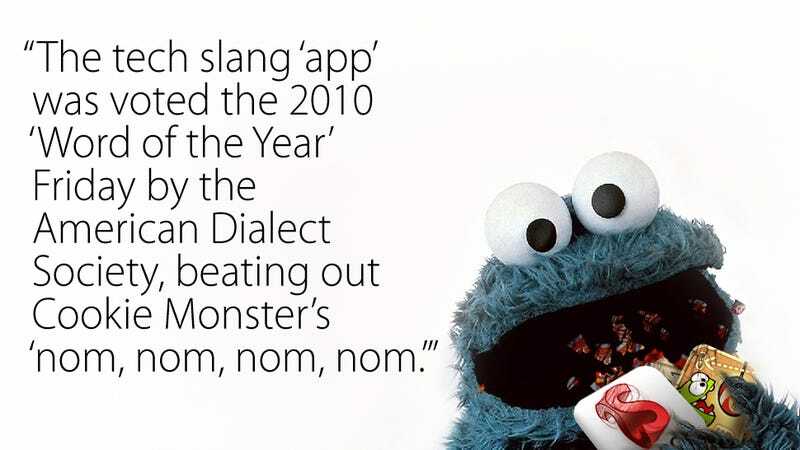 After what must have been a passionate debate, the American Dialect Society has deemed "app" the 2010 Word of the Year, beating out Cookie Monster's "nom." It sounds like we need to get our consumption priorities straight. Yes, according to the experts, 2010 was the year of the "app," which I guess doesn't seem altogether unreasonable. I certainly heard it used a lot, and said it a good deal myself. And with the recent introduction of the Mac App Store, the dominion of the "app" has expanded even further, creeping from our phones to our desktops. Apps are here to stay. Get used to it. "Nom" - a chat-, tweet-, and text-friendly syllable that connotes "yummy food" - was the runner-up. It derives from the Sesame Street character's sound as he devours his favorite food. The vote came at a Pittsburgh hotel ballroom during the national conference of the Linguistic Society of America, an umbrella group that includes the Dialect Society. About 120 of the 1,000 conference attendees voted in the "competition" with neither side entirely satisfied. Critics of "app" said the word was somewhat stale, while proponents said 2010 was the year the word became omnipresent - with one arguing that her elderly mother knows the term, even though the woman doesn't have any apps. "Nom" supporters simply liked it's cheeriness. I'd also point out that "nom" is a preferred verb for describing the mindless act of eating unique to zombies, which also had a boom year in 2010.